The opening ceremony of the London Olympics is tomorrow, but if you're like me, you're probably enduring the swimming, track, and archery hullabaloo, waiting anxiously for the most exciting event of the games begins: women's artistic gymnastics, and the perky hairstyles that accompany the event. One word immediately comes to mind: scrunchie. Ah, yes, the scrunchie. To most, it is merely a fashion faux pas of yesteryear –- drumming up visions of The Baby-sitters Club -– but the scrunchie still gets its game on, capturing the attention and hearts of millions when, once every four years, it displays its ruffled glory at the International Scrunchie Competition (otherwise known as women's Olympic gymnastics). But dominant as it may continue to be, the scrunchie hasn't always held court on the Olympic stage. Competition hairstyles have often reflected the times — Vera Caslavska's gravity-defying beehive bob in the 60's, Nadia Comeneci's ribbon-tied ponytail in the 70's, Shannon Miller's blow dried bangs in the 90's, and the glittered slick-back of Carly Patterson in the 2000's. 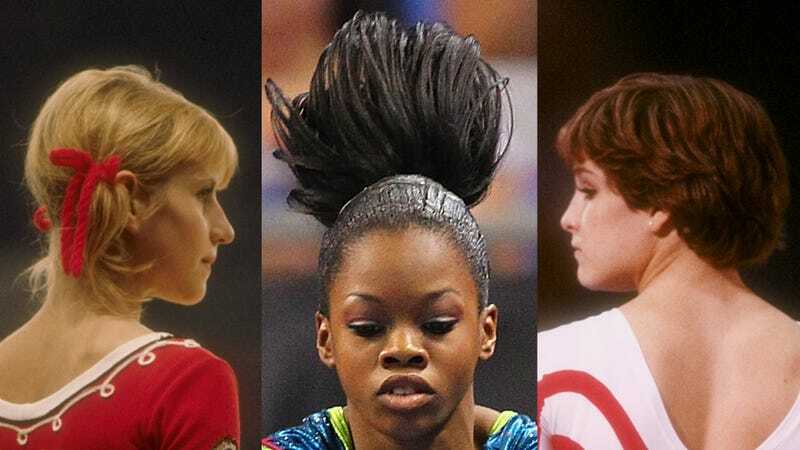 What hairstyle makes the journey to London remains to be seen, but until we know for sure which hair has what it takes to bring home the gold, let's take a walk back through gymnast hairstyles that brought us here. Two-time Olympic gymnast Marian Barone of the USA rocks "the baby" 1940's haircut during the last London Olympic Games. Russian gymnast and fashion luminary Dana Ingrova is ahead of her time with pigtails and bows at the Olympics in Helsinki. The ever-styling Team USA gymnasts wear "the poodle" and "betty bangs." Vera Caslavska of Czechoslovakia wins gold and platinum blonde as her bouffant-ed rivals stand by. Pigtails were back in action in the early 70's as seen on Soviet gymnast Olga Korbut. How old is this child? Romanian Nadia Comaneci makes the ribbon-tied pony tail iconic in the mid-70s, influencing field hockey players everywhere. Mary Lou Retton shows off a shaggy bowl cut. Jonathan Taylor Thomas, age 3, takes notice. Hello, scrunchie! Olympian heavy hitters Shannon Miller and Kim Zmeskal launch an era of gymnastics scrunchie wear with their early 90's Barcelona Games look. Team USA dons classy white scrunchies and thin bangs for a very strong hair showing at the Atlanta Games -– home hair advantage. Rivaling Olympic figure skater Dorothy Hamill and her wedge haircut, Kerri Strug gave us one of sports most iconic ‘dos with her feathered pixie. Russian gymnast, seven-time Olympic medalist, and Uma Thurman look-alike Svetlana Khorkina, stands out not only for her gelled pixie cut, but also long limbs. The Sydney Olympics was a transitional time for gymnastics hair, some still harkening back to the 90's Dominique (Dawes and Moceanu) era bangs, but others moving the tide forward with smoothed-back ponytails. A mid-2000's bang backlash leads to a slick glitter gel and hair clip overdose for the women of Team USA 2004. A compromise? No more bangs-be-gone. In 2008 Team USA could. not. get. enough. of the front hair pouf, as seen here on Samantha Peszek, Alicia Sacramone, Shawn Johnson, and Nastia Liukin. Team China, led by Yang Yilin (in the photos on the right), sported face-liftingly tight buns and decorated their tiny coifs with bright hair clips for their home country's Games. A new day: Nastia Liukin shocks gymnastics faithful with a loose, messy bun. Olympic qualifier McKayla Maroney also with an unorthodox messy bun. Olympic qualifier, soon-to-be household name, and cute as a button Gabrielle "Flying Squirrel" Douglas plays it safe with an extensively hair clipped ponytail. The ever serious Jordyn Weiber keeps it classically simple with a tidy pony tail. Despite the eternal evolution of gymnasts' hair, some things always stay the same. The long time Olympic gymnastics coach is our lighthouse in the storm with his ever present Lech Walesa stache and hair. Mustache: Yesterday, today, forever. Katie Long is a freelance journalist. Her work has appeared on public radio's Marketplace and Studio 360, as well as in New York Magazine. You can reach her via twitter @kitemaster.